Half the time, we’re so distracted by so many things, we practically let our lives fly past. Sometimes we’re just in our head, opening the portal to the doors in the space-time continuum labelled “Past” and “Future”. Other times, we’re sucked into the Black Hole of the Internet. It’s like we can’t afford to pay attention to our life anymore, and for some, it takes walking right into a glass door with our head hung over our phone to knock some sense into us. Or not. This entry was posted in Life Lessons, Mind and tagged Life, mindfulness, presence. There’s a whole industry out there trying to convince you that the new year is the year of a new you. As they try to shove yearly planners down your throat and sign you up for a whole year of gym membership at a 50 % discount, it’s very easy to be carried by the wave. If you really think about it, they should verify the famous slogan to, “New Year New You with a More Famished Wallet.” Despite all that hype, only 8 % of people keep their New Year’s Resolutions – statistics which make one wonder why the 92 % even bother. Making NY resolutions tends to be more of a procrastination strategy than a personal development one. The idea that you’re supposed to wait for a certain time or date to begin something makes it easy to procrastinate on important life decisions. Decisions you know would make you slightly uncomfortable. So the obvious solution to that is to implement a good idea the day you hear it, regardless of whether it’s New Year’s Day or Mid-April or the end of November. A resolution is like a promise you make to yourself. The main reason promises find themselves broken like new toys in the hands of a toddler, is because the mindset breaking it is different from the mindset making it. On January 1, it’s very easy to be pumped up and excited about our resolutions because many people are talking about it. You write your resolutions about losing weight, eating healthy, spending less on a large sheet of paper. Come Day 30 and that paper acts as a coaster for your ice cream tub. So an alternative to making this promise to yourself and then disappointing yourself continuously is to take stock of your life right now, and work on fixing it one small habit at a time. It’s known that drastic changes are hard to make because of our habits. We can say that we want to lose weight but as long as the cue-routine-reward cycle exists in our brain (as explained in Charles Duhigg’s The Power of Habit), it’s going to be tough. Know thyself. Identify your habit cycles and start breaking them down. The Power of Habit is a highly recommended read for this particular step. Think in terms of forming habits instead of making individual goals. For instance, let’s say we want to lose 5 lbs this year; that’s a goal. We’ll always be in a state of disappointment until we reach that goal – that’s if we reach it. And as millennials we’re not so into long-term gratification. We want results like…yesterday! So instead of setting a goal that way, we can focus on making it a habit to take a thirty minute walk everyday or hit the gym three times a week. Taking that first step will help provide us with instant gratification, build our success spiral and all in all, make us feel good. Link habits together to build integrated systems. This needs some thinking and tinkering but basically the secret is to link new habits with long-established habits. So if you’re used to taking a nap in the afternoon, and you want to start doing sit-ups for instance, link the afternoon nap with the sit-up to maintain consistency. The moment you pile habits together and build a system, it becomes this behemoth giant that’s hard to slow down once started. Work from your personal values. I’ve written about this previously. A lot of times we just want to incorporate things into our lives because other people think it’s a good idea. But if it’s not a good idea for us on some deep personal level, then we’d lose traction faster than tires on black ice. Reduce the inertia. We’re not big fans of change so the hardest part of starting anything is overcoming that initial inertia. Sometimes one needs to think of ways to reduce the inertia, for instance in the gym case, some people keep their gym clothes ready the night before so they can launch into their workout routine as soon as they wake up. Experiment. Everybody’s system is going to be different and there’s no way of knowing what works for you until you experiment. Some people get stuck in the idea collection stage without executing anything but until we try we never know what’d work. The secret is to work on your own personal project and have fun doing so. Last but not least, just start! Today. Not tomorrow. Not January 1. Not May 25. Just start today. This entry was posted in Life Lessons, Mind, Personal Development, Uncategorized and tagged habits, personal development, resolutions, self-improvement. So imagine you’re reclined on a favorite couch, reading, when you suddenly come across a sentence so profound you just need to sit up for it. Soon enough – after highlight that sentence of course- you realize you can’t read anymore because the gears in your brain just won’t stop turning. Finally you decide to stop reading and do something about that idea; write it down, talk to someone about it…etc. Books are powerful weapons. So if you need recommendations on books to read – or give as gifts – so you and your loved ones can enter the new year with new ideas and a whole new mindset, check the list below. 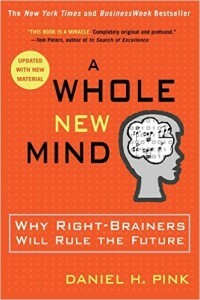 Even though recent research has debunked the idea that logical, methodical, analytical people use their left brains preferentially while the creative types are right-brain dominant, Dan Pink argues that sparking our creativity is essential as we approach the end of the knowledge worker’s era and the beginning of the creative worker’s era. With material abundance, technological advancement and globalization taking over the business world, workers would need to rely on creative thinking skills to really stand out. He goes on to speak in detail about the six senses; Design, story, symphony, empathy, play and meaning. This book really challenges many assumptions made in our societies. Creative people are usually looked down upon. The starved artist is quite the cliched character, so children from a young age are encouraged to suppress their creative side. A talk that goes in line with the topic is Ken Robinson’s famous TED talk on how schools kill creativity. Everybody keeps on talking about how you have to follow your passion and then the money would follow. This books consoles those who don’t break free from the corporate cubicle to pursue their passion and argues that passion isn’t everything. Instead the author talks about how one must build his career capital by obtaining skills through hard work in order to achieve mastery, autonomy and mission. Again, whether you agree with it or not is irrelevant; the book will make you think. I’ve written about it in a previous post. This is a personal favorite. It’s on my TBRA (To-be-read-annually) pile. 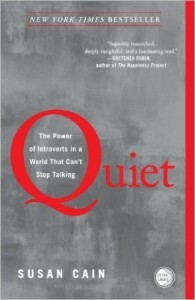 Susan Cain has given voice to the millions of silent and misunderstood introverts who get energized by staying alone. Every time I read it I discover something new in it. I personally wish I could distribute this book in our society because introverts get a bad rep as anti-social. Sometimes other people fail to realize that our own company is the best company we seek and it really has nothing to do with them. It’s definitely a topic for conversation during family reunions this holiday. This book was a pleasant surprise. 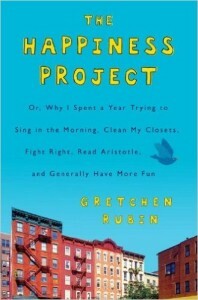 At first, I didn’t think that the details of someone else’s personal happiness project could be relevant to my life, but the book was filled with so many good ideas, it rendered my highlights section pretty useless as there are so many highlight, I might as well read the whole book again. So which books have you read already? And which ones are you planning to read next? Leave your comments in the section below. This entry was posted in Book Review, Inspiration, Life Lessons, Mind, Reading and tagged book recommendations, Book Review, books, mental, Reading. The good thing about living in our age is that the internet is filled with career advice. The bad thing about living in our age is that the internet is filled with contradicting career advice. The economic crisis happened the year I graduated, which meant I didn’t have to look far and wide to discover that “Go to school, get into a good university, get a good job and you’re set for life” no longer applied. All I had to do was go to work one day and see the empty desks around me. Apparently our peers in the Western world had discovered that a bit earlier but living in the Middle East, someone seemed to have missed the memo. So at some point in your life, it’s 6abee3i jiddan (natural) to type into google, “I hate my job wh…” and google totally gets you. The trick is to somehow find your way through the 264,000,000 results that come up. Some people will tell you to follow your passion, and again, if you live in the part of the world where you’re branded an engineer or a doctor from the day you’re born, then there’s a high chance your passion is very much different from what you’ve studied. However, the main risk connected with following your passion is you’ll be broke — for a very, very long time — and following your passion — or doing anything in fact — is pretty difficult when you’re broke and hungry. Then Cal Newport entered the scene with his message, “Why ‘Following your passion’ is bad advice,” in his book So Good they Can’t Ignore You. His advice focuses on how passion comes after working really, really hard on something, and being really good at it. So let’s say you’re really passionate about counting baby coconuts. The most that someone might pay you for counting coconuts is a free baby coconut drink. But the world might not be ready for your counting-coconut-services, so following your passion happens to be really really really bad advice. So let’s say you’re one of those people who doesn’t know what their passion is.It’s very easy to read all this stuff on the internet and get pretty pumped up about quitting your job and hitchhiking around the globe to discover what your passion is. It’s easy theoretically, but pretty hard practically (read $$$$). But here’s one thing to know about those successful ‘follow your passion’ stories on the internet. To each one, there are probably five failure stories that don’t get reported. Do you get intellectually challenged at your job? Are you building your skill set? Do you enter a state of flow while you’re working? Is the world ready to pay you for your services? If the first three answers are no, then those might be your reasons for ‘hating your job’ not that you’re not passionate about it. Maybe if you find something else in the field that intellectually challenges you then you might throw those ‘Malaysia, truly Asia’ brochures out the window. If you do know what your passion is, and really want to make money out of it, then work at monetizing it before you quit your day job. Ask the world if they are ready to pay for it and don’t be like that coconut-counter. The trick is whatever you do, do not make rash emotional decisions based on one bad day at work. Even people who follow their passions will tell you it’s not always good in the ‘Living My Dream’ world. There are difficult clients, and tasks they hate doing but have to do it anyway. 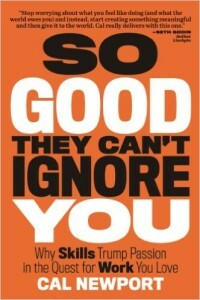 And if you’re not really convinced, read Cal Newport’s “So Good They Can’t Ignore You”. He definitely does a better job convincing than I do. Like this article? Share it with your friends on facebook. This entry was posted in Inspiration, Interesting discussion, Life Lessons, Mind, Personal Development and tagged career, Life, Life Lessons, Passion.